The Mala Kate is based in Split, Croatia. The crew there have this wonderful 2006 Antares 10 powerboat available for charter. The spacious cockpit offers fantastic panoramic views while the cozy cabin sleeps 2, with an additional 2 spaces in the salon. 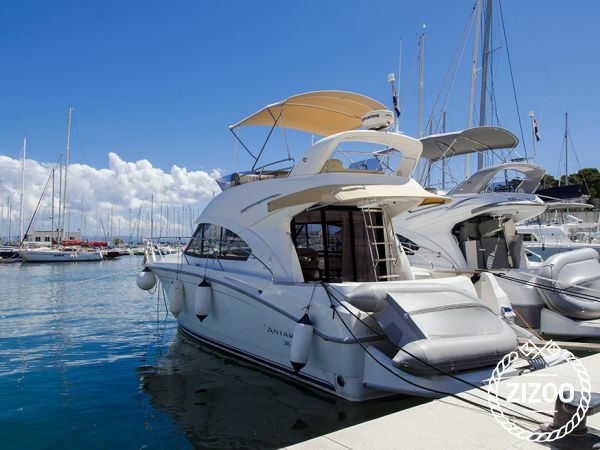 Take this powerboat for a ride and feel the spray of the cooling water while bask in the glory of the Adriatic sun. Check out the Island of Bisevo and its magnificent Blue Cave, or explore the former military base of the Island of Vis, whose breathtaking nature leaves many the visitor speechless. And don't forget to stock your kitchen with Croatian delicacies such as prosciutto, cheese, wine and olives. Make a pit stop in Makarska for coffee and ice cream, or check out Hvar for its cocktails and clubs. The kids will love Vodice and its bouncy water parks and stretches of beaches. Whatever your pleasure, you can rest assured, there is plenty to choose from, and then your charter crew will gladly help you with all your questions and needs. Tausend dank für einen unvergesslichen Urlaub! Requested 34 times this week!